November 12, 2015 07:00 ET | Source: Dynacor Gold Mines Inc.
MONTREAL, QUEBEC--(Marketwired - Nov. 12, 2015) - Dynacor Gold Mines Inc. (TSX:DNG)(OTC:DNGDF) (Dynacor or the Corporation) is pleased to announce the results of a 30-meter extension of Raise-215 in the Manto Dorado on the Tumipampa project, Peru. Over a total extended length of 65 meters Raise-215 has an average gold grade of 21.88 g/t (0.70 oz/t) and 1.65 % copper over an average true width of 1.18 meters (the results for the first 35 meters were published earlier (see press release dated October 8th, 2015). Channel sampling along a raise has exposed a massive (65 meters long) high-grade gold-bearing structure, with an average true width of 1.18 m, of copper sulphides. 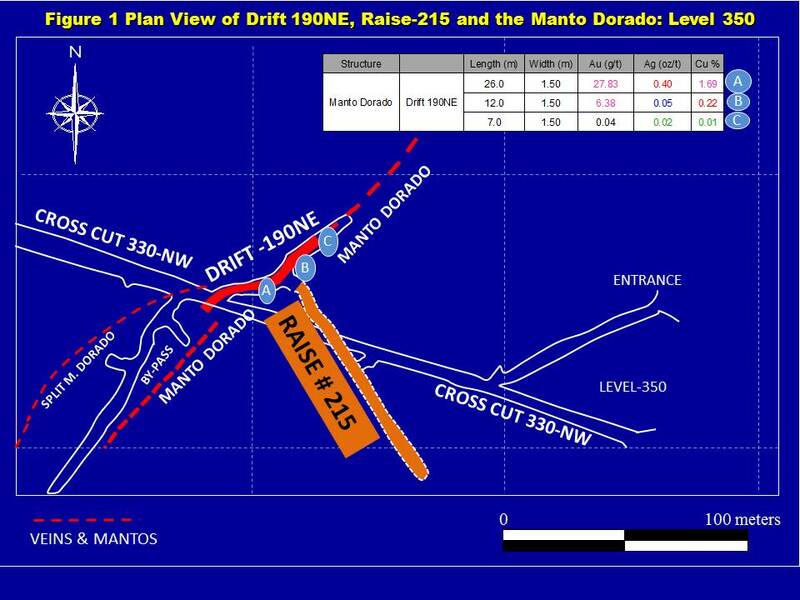 Raise-215 is being excavated from the 27.5-meter mark along a 45-meter drift (Drift-190NE) orientated N45°E that was excavated in the Manto Dorado structure (see Figure 1). A further 30 meters has been excavated in this raise and the results are given in Table 1 and Figure 2. Along the 65-meter long raise, channel sample assays include: seventeen (17) channel samples with uncut gold assays between 31.1 g/t (1 oz/t) and 76.2 g/t (2.45 oz/t) and twenty (20) channel samples with uncut copper assays between 2% and 8.7%. 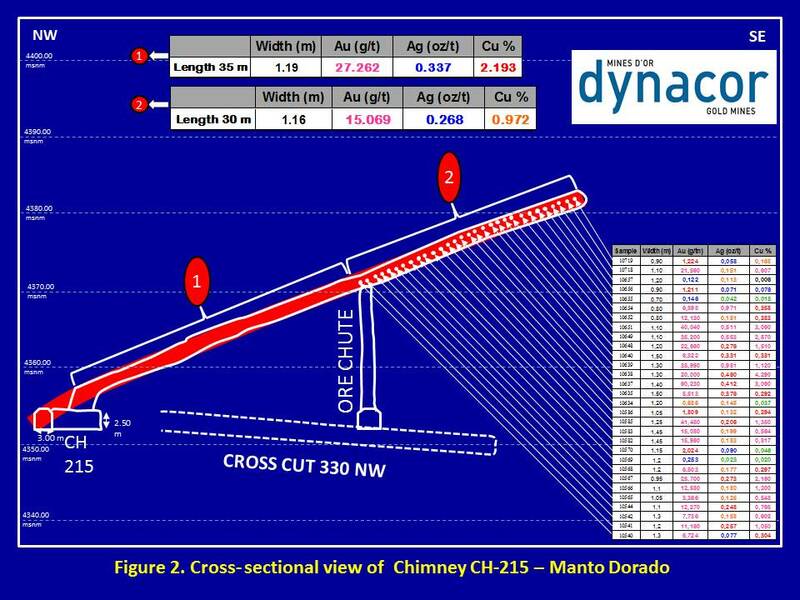 Dynacor is continuing the excavation of Raise-215 in the Manto Dorado and the results will be published as soon as they are available. Map to the figure one available at the following link: http://media3.marketwire.com/docs/Figure_1_ppt_level_350_151106.jpg. Map to the figure two available at the following link: http://media3.marketwire.com/docs/Figure_2_CH215_151106.jpg. Dynacor is a gold ore-processing and exploration Corporation active in Peru since 1996. The Corporation differentiates itself from pure exploration companies as it generates income from its wholly owned ore-processing plant. Dynacor's basic share count at 37.4 million outstanding is in the lowest quartile of the resource sector. The Corporation's assets include three exploration properties, including the advanced high-grade gold Tumipampa property and an operating 85,000 TPA gold and silver ore processing mill at Metalex-Huanca. The Corporation obtained its permit to construct a brand new 300 tpd mill in Chala Peru. This represents an important milestone for the Corporation's future growth. The Corporation's strength and competitive advantage comes with the experience and knowledge it has developed while working in Peru. Its pride remains in maintaining respect and positive work ethics toward its employees, partners and local communities.